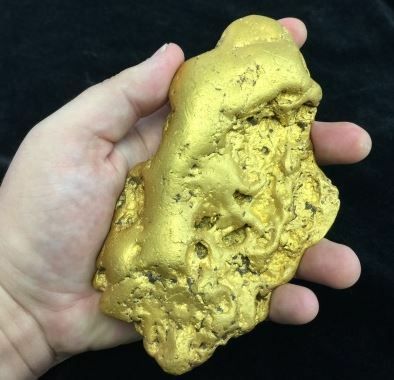 A 6.07 pound (2.8 kg) ‘Butte Nugget’ of gold was bought by a “prominent Bay Area collector” for about $400,000, said Don Kagin, the Tiburon-based coin dealer, which he said was not far from the asking price. The nugget went up for sale on Thursday at the San Francisco Fall Antiques Show and was sold within one day. California has a long history of nugget finds, dating back to the 19th century Gold Rush. In 1859, a massive 54-pound chunk was discovered in Butte County. A ‘gold rush’ occurs when many people come to an area seeking to get rich after word got out that somebody found gold. It has been at least thirty years since any gold nugget weighing more than 6 pounds has been found in California. The nugget was found in July 2014, in the mountains of Butte County by a gold hunter, who asked the coin dealer to keep his name and where he made his find secret. Interest in purchasing the large nugget came from far and wide, including Australia, according to local newspapers. Mr. McCarthy said nuggets of that size do not come along every day. He had never expected to see one unearthed in California during his lifetime. It is not uncommon for people to come with large nuggets claiming they were found in California, only to discover later that they actually came from Australia, were bigger ones are more common.